SC police shoot & kill man running away. Police claim to have “felt threatened”. The footage filmed by a bystander, which The Post and Courier obtained Tuesday from a source who asked to remain anonymous, shows the end of the confrontation between the two on Saturday after Scott ran from a traffic stop. It was the first piece of evidence contradicting an account Slager gave earlier this week through his attorney. The U.S. Department of Justice said in a statement that FBI investigators would work with the State Law Enforcement Division, which typically investigates officer-involved shootings in South Carolina, and the state’s attorney general to examine any civil rights violations in Scott’s death. The 9th Circuit Solicitor’s Office will prosecute the murder charge that carries from 30 years to life in prison. The Police Department, which has 343 sworn officers, has fought accusations in the past that aggressive patrolling tactics had unfairly targeted poor, predominately black communities. The newspaper reported in September that 18 percent of the officers were black while the city’s population is 45 percent black. Scott’s older brother, Anthony Scott, called on community members during a news conference late Tuesday to pray for his family. Community members planned to protest Scott’s death Wednesday morning in front of City Hall. Ed Bryant, president of the North Charleston chapter of the NAACP, said communication between neighborhood leaders and police commanders had improved since Chief Jon Zumalt left the department in early 2013. But the community’s relationship with the department’s rank-and-file members was still strained, he said. Gov. Nikki Haley said in a statement late Tuesday that the shooting “is not acceptable” and not indicative of how most officers in the state act. The three-minute clip of Saturday morning’s shooting starts shaky, but it steadies as Slager and Scott appear to be grabbing at each other’s hands. Slager has said through his attorney that Scott had wrested his Taser from him during a struggle. The video appears to show Scott slapping at the officer’s hands as several objects fall to the ground. It’s not clear what the objects are. Scott starts running away. Wires from Slager’s Taser stretch from Scott’s clothing to the officer’s hands. With Scott more than 10 feet from Slager, the officer draws his pistol and fires seven times in rapid succession. After a brief pause, the officer fires one last time. Scott’s back bows, and he falls face first to the ground near a tree. 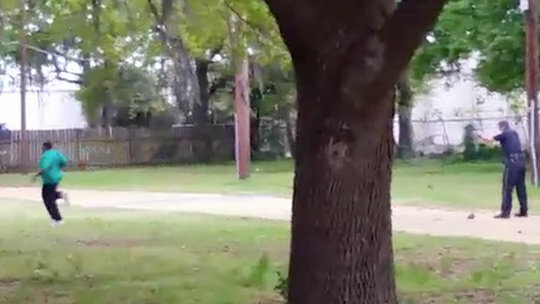 After the gunfire, Slager glances at the person taking the video, then talks into his radio. The cameraman curses, and Slager yells at Scott as sirens wail. “Put your hands behind your back,” the officer shouts before he handcuffs Scott as another lawman runs to Scott’s side. Slager soon jogs back to where he fired his gun and picks up something from the ground. He walks back to Scott’s body and drops the object. Through the entire footage, it’s not clear whether Scott ever had control of the Taser. At the time, he was wanted for arrest on a Family Court warrant, Charleston County sheriff’s Maj. Eric Watson said Tuesday. He had a history of arrests related to contempt of court charges for failing to pay child support. The only accusation of violence against Scott during his lifetime came through an assault and battery charge in 1987. The mayor and Police Chief Eddie Driggers expressed sympathies to Scott’s family. Driggers grew emotional as he referred to his police officers as his children. Slager, a former Coast Guardsman with two stepchildren and a wife who is expecting a child, served for more than five years with the department without being disciplined. Two people filed complaints against Slager during his time with the force, including one man who said the policeman shot him with a Taser for no reason in September 2013. Internal investigators exonerated the officer of any wrongdoing, though the suspect in that case was never arrested. Yolanda Whitaker, a North Charleston woman who witnessed the 2013 incident and gave her account to the investigators at the time, told the newspaper Tuesday that Slager pulled Mario Givens, who was clad in boxer shorts, from his home and shot him with a Taser. Whitaker watched the ordeal unfold from inside Givens’ home. Attempts to contact Slager by telephone and at his Hanahan home before SLED agents arrested him were not successful. “This is a terrible tragedy that has impacted our community,” his former attorney said. The footage comes amid a discussion about race and policing in the U.S. fueled by the fatal shooting in August of Michael Brown in Ferguson, Mo. Brown, an 18-year-old black man, was unarmed at the time, but witnesses said he got into a struggle with Officer Darren Wilson, who is white, and was shot during the scuffle. Though a grand jury did not find any reason to indict Wilson, the shooting ignited protests, some of which turned violent. A “black lives matter” movement inspired talk about whether police nationwide resort to deadly force too quickly against black men. During the wave of sentiment that prompted rallies in the Charleston area, a state trooper was captured on video shooting a man who had reached for his driver’s license during a Columbia traffic stop. The trooper was arrested. Community leaders in North Charleston stressed the need for calm in the aftermath of Scott’s death. Bryant, the local NAACP official, said he was taken aback by the video. But he encouraged investigators and prosecutors to pursue justice in Scott’s death, and he urged openness from the authorities. Pastor Thomas Dixon, a community activist, said that he is concerned about outsiders coming into the community to incite violence. He said the outcry of anger so often ends up “tearing down our communities,” and emotions should be diverted to something more constructive than violence. North Charleston Councilman Ron Brinson said the officer’s arrest was “sad, sad news” for the city. Slager said earlier this week in the statement from his attorney at the time that his encounter with Scott had started around 9:30 a.m. Saturday as a routine traffic stop. His department said he pulled over Scott’s Mercedes-Benz sedan near Remount and Craig roads because it had a broken brake light. But at some point, Scott ran away with Slager in pursuit on foot. Scott’s passenger stayed with the Mercedes. During the foot chase over a dirt-surfaced road near a small park, Scott confronted Slager, according to the lawyer’s statement. Slager got out his Taser to subdue the man, but Scott took the device during a struggle, the statement said. That’s when the officer fired at Scott several times because he “felt threatened,” it added. The bystander’s cellphone camera continued to roll as Slager stands over Scott and another officer puts on gloves. During the 21/2 minutes after the shooting until the end of the video, the backup officer lifts up Scott’s shirt to check his wounds. But no one immediately starts CPR. The police have said, though, that they tried desperately to save Scott until paramedics showed up. The video ends with Slager standing next to Scott, who was still face down, and checking the dying man’s pulse. Though the video buoyed the family’s hope for justice in Scott’s death, his younger brother said it had already given him nightmares. “Every time I close my eyes, all I see is my brother taking those bullets,” Rodney Scott said. “I can’t sleep.”.